Take a seat. We are here to support you in your success. At the L. Robert Payne School of Hospitality & Tourism Management, your classroom reaches far beyond the walls of our building and your practical work experience. Employers are interested in a well-rounded candidate. Education + practical work experience + involvement in extra curricular activities is an equation that yields success. We encourage our students to hang out in our lounge and get know their peers and professors; become an advisor or teaching assistant; take on a project through a student organization; and travel. How you complete the equation is up to you. Our student organizations, studies abroad, scholarship opportunities, and expert advising put you on the path to great achievement. We believe in creating a culture where students can not only survive, but also thrive. We do this thru one on one meetings with students, providing mentoring opportunities outside the classroom, requiring a diverse range of work experiences and providing numerous opportunities for students to step outside their comfort zone. One of our most successful to date has been getting students involved in the National Society for Minorities in Hospitality (NSMH). This year, we took 35 students along with three faculty advisors to the beautiful city of Jacksonville Florida for the NSMH National Conference. At this conference, students are given a variety of professional development opportunities that allow them to learn and grow with the personalized help from both faculty and industry professionals. Students participate in a range of fun activities including a “lip sync battle” with their professors and school director, to more professional opportunities such as the career fair and industry networking suites. Additionally, students attend hands on educational workshops on various topics ranging from “finding financial stability after graduation” to “how to negotiate for your first job”. 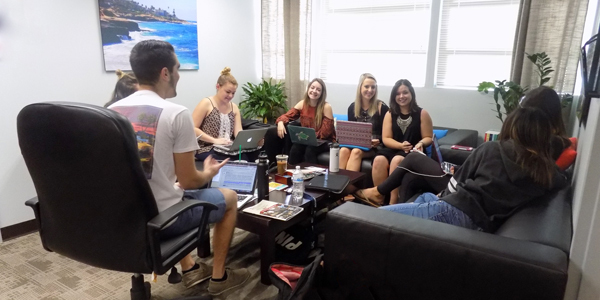 Beyond the advantages of building relationships with professionals, students experience what it is like to be a member of the HTM/RTM family here at SDSU. In this video students can be seen interacting and engaging with industry, performing with their faculty members and school director Carl Winston, AKA, the cookie monster and making their way to job interviews that ultimately led to job offers. This video represents courage, strength, spontaneity, teamwork and breakthroughs. Students who attend this conference continuously report what a life changing experience NSMH Nationals had been for them! We hope to see you there next year!